Conflicts of interest within the ruling class and its problems in enforcing a coherent political perspective clearly limit its capacity for strategic planning, but if this point is pushed too far it can lead to a serious underestimation of continuing organized ruling class efforts to maintain and extend effective command over potential insurgencies. Even while global capitalism flounders, important ruling class fractions and semi-autonomous elements of repressive state apparatuses are developing and testing methods to disrupt and demoralize radical oppositions. An increasingly effective array of these counter-insurgency tactics, mainly, but not exclusively implemented through the state, are likely to be a growing part of our future. For some time ‘law and order’ policing in this country has been supplemented by counter-insurgency approaches to managing popular oppositions — particularly oppositions that have some potentials to combine a mass base and a revolutionary trajectory. However, although they are often combined, they are distinct elements of capitalist power and they require different political responses from radicals. In the early eighties, a small group in STO focused on what we termed ‘new’ state repression. For us, the ‘new’ elements in state repression were part of the imperial response to national liberation (including the Chinese Revolution). As capital’s ruling elites were confronted with increasing challenges and a growing instability, their response would increasingly adopt the counter-insurgency approach to repression highlighted in Kitson’s monographs on the British suppression of anti-imperialist rebellions in Malaysia and Kenya. Four decades later our position has gained a little more acceptance, however, compared with the simplistic sloganeering that presents the goal of the state as, ‘jailing the revolution’, and the repression of revolutionaries as prelude to and pretext for the repression of everyone else, it is still very much a minority position. Counter-insurgency tactics began to be applied in this country as mass radical potentials re-emerged with the Civil Rights movement in the mid-fifties. However, they were heavily adulterated by the more traditional methods exemplified by J. Edgar Hoover’s ghost-written book, “The Enemy Within”. Hoover saw the ‘enemy within’ as a sickness in the body politic, a social infection propagated by a criminal, largely ‘alien’ (foreign) conspiracy. Radicalism in general, and communism in specific, was a social pathology that could be quarantined and cured/eliminated through public exposures and stronger legal proscriptions. The sixties marked a turning point in political repression in this country as the FBI, CIA, military police, local ‘Red Squads and Gang Crimes divisions, were increasingly coordinated through various ‘Cointelpro’ programs. However, by the early seventies the resulting ‘excesses’ were eroding the social consensus on which legitimacy depended and cointelpro was increasingly problematic for significant sectors of the ruling order. This was particularly true with respect to cointelpro tactics, for example ‘pseudo gangs’, that clearly implied a counter-insurgent approach. By the end of the seventies, institutionalized legislative oversight and rules that limited everything from infiltration to assassination were put in place, while the local ‘Red Squads’ that had coordinated with the FBI and military intelligence were exposed and shackled with ‘consent decrees’. Such measures were viewed as effective safeguards against ’rogue’ operations in the future, and left/liberal common sense assumed that the worst ‘abuses’ of domestic cointelpro (along with the complementary CIA practices) had been ended within the system. Not everyone saw things this way, but many left/liberals did and a good number still do. The most positive contribution of the Leonard and Gallagher book is its evidence for a different narrative where the development and implementation of counter insurgent tactics continues in a more selective and purposeful form throughout the period. If anything, the authors are too restrained in drawing the political implications of their research for our current circumstances. ‘Operation Solo’ was a penetration of the CPUSA and the Soviet sector of international communism run by a small, highly secure FBI grouping in Chicago. The operation was based on a Chicago businessman, Morris Childs, his brother Jack, and their respective wives. Morris Childs had been an important member of the CPUSA, a national Committee member and the editor of the Daily Worker for a short time. Both Childs brothers left the CP in the late 40’s over political differences and personal grievances. Morris and Jack were approached by the FBI in 1951 and both agreed to rejoin the CP as informants. The FBI installed Morris in a Chicago import business that provided cover for numerous foreign business trips — specifically to the Soviet Union. Very quickly, Childs became the ‘official’ link between the National Committee of the CPUSA and the Central Committee of the CPSU. His brother was assigned a facilitating role — both by the CPUSA and by ‘Solo’s’ FBI handlers. For decades, for security reasons, the entire operation was kept under extremely tight cover by the Solo team in the FBI. The CPUSA side of the program also chugged along with no collective oversight at any level — also allegedly for security reasons. Morris Childs played a significant role in international communist politics as a recording secretary for the highly sensitive international meetings from the 1956 20th CPSU Congress to the 12-Party and 81-Party Conferences that culminated in the Sino-Soviet split — but here I’ll concentrate on his impact on domestic politics. Childs was the conduit for Soviet money to the CPUSA and had a major voice in how it was allocated. He provided the official ‘line’ on every significant political question; U.S. elections, Cuba, Eurocommunism, Hungary, Czechoslovakia, Vietnam. His access to Soviet intelligence sources impacted significant political and security questions within the CPUSA. I knew Morris Childs. We both were on the CP National Committee for a handful of years in the late sixties. While his relationship to the Soviets was not explicit, it was widely known in the CP leadership. The unruly faction I belonged to referred to him as the ‘Ambassador’. At times, we harassed him at meetings with demands to know what the ‘Ambassador’ thought on various questions — 1968 Czechoslovakia and a proposal to restart a daily CP newspaper were topics that I remember. When Solo was partially exposed in the early eighties, the STO Repression Group assumed that Childs was Solo, since we knew about his role in the CP. We selected Childs for one of the informer/provocateur profiles that we were researching with particular attention to his role in the FBI cointelpro operation against William Albertson that had been exposed in the Media documents. In the course of this, we approached the C.P. and asked if they were doing a damage review. They did not regard this as a friendly gesture and perhaps it was not. In any case, ‘Solo’ continued to function in the CP for a few more years. Then Jack Childs died and Morris retired ending an operation that covered more than three decades. In 1996, the Barron book on SOLO was written with the cooperation of Childs and the FBI. It features pictures of Childs receiving the ‘Order of Lenin’ from Brezhnov and the “Medal of Freedom” from Reagan. Nevertheless, the pathetic remnants of the CP still maintained that it was a fabrication. So did various luminaries, e.g. ; Theodore Draper in a review in the New York Review of Books. The additional documentary evidence that Leonard and Gallagher present should put such ideas to rest. Two things are noteworthy in Leonard and Gallagher’s treatment of Solo: they indicate the FBI’s changing political priorities; they deepen the understanding of the content and purpose of the FBI’s counter-insurgency approach. I was minimally politically aware during the fifties and sixties and remember the FBI’s public stance on the CP’s political and financial relationship with ‘Moscow’. Whenever the FBI budget came up, Hoover would present grotesquely inflated pictures of CP influence, topped off with the claim that the marching orders and the money for the ‘enemy within’ came from the USSR. Hoover was frequently confronted with demands that he provide some proof that the CPUSA was directed and financially supported by Moscow. He never did — even when the failure resulted in substantial public embarrassment. But for decades, Solo had provided Hoover with ample evidence for a response. The Barron book describes how the FBI photographed and inventoried every bill of the tens of thousands that Childs brought back from the USSR, replacing each with clean bills that the U.S. Treasury wouldn’t link to the USSR. To keep the Solo operation afloat, a very small grouping in the FBI opened their entire organization to significant public relations damage. They chose the opportunity to better know their enemy — and, more important, the opportunity to influence what that enemy was thinking and doing — over a massive domestic propaganda coup. “The FBI’s Maoist Sect” – the ‘Ad Hoc Committee for a Marxist Leninist Party’. 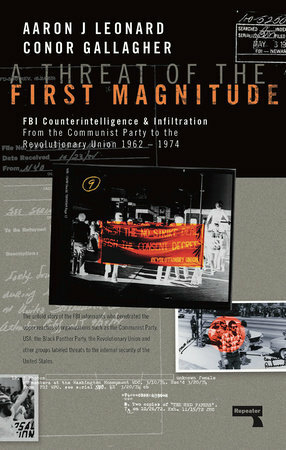 I think the unique value of Leonard and Gallagher’s book is the exposure of this operation, and particularly its role in the efforts of the state to prevent the unification of U.S. Maoists into a single party — the danger that the FBI saw as, “A threat of the First Magnitude”. Whether the FBI correctly estimated the threat can be debated. In the opinion of the authors (e.g., see page 179) and mine as well, the rapid swing to the right by Chinese Communism probably had more to do with the decline of Maoism globally and in the U.S. than this FBI operation. However, this doesn’t reduce the importance of understanding the repressive tactics that were employed against the CPUSA, the PLP, the RU/RCP and a number of Maoist formations from the early sixties to the early eighties. The centerpiece of these tactics was the role of the, ‘Ad Hoc Committee’. This formation was almost completely an FBI construct. While it’s unclear if it had any membership outside of agents and informants, it had a real influence and an array of genuine supporters. A significant component of the left accepted the legitimacy of the Ad Hoc Committee’s politics and never challenged its secrecy. This allowed it to function effectively for well more than a decade. Before focusing on some specific issues, I want to sketch in some elements of this history that the book treats in more detail. Shortly after the formalization of the Sino-Soviet split in 1961, the ‘Ad Hoc Committee for a Scientific Socialist Line’ emerged in Chicago with a clandestine bulletin titled, “Wither the Party of Lenin?” A series of similar — FBI-composed — clandestine bulletins became influential documents for the pro-Chinese alternatives that were beginning to coalesce in opposition to the Soviet-supporting CPUSA. As the Progressive Labor Party emerged from this milieu, the Ad Hoc Committee modified its name to the ‘Ad Hoc Committee for a Marxist Leninist Party’. From that point, it played an important role, first promoting the PLP and then criticizing it for deviating from the Chinese line; then following a similar path with the RU/RCP and, a bit later, with the proliferation of Maoist groupings that emerged from the wreckage of the movements of the late sixties. A couple of personal experiences generally support the argument and evidence in the book. The authors cite an FBI report on CP dissidents in Washington State circa 1964 (see p. 51). My parents were active in the Olympic Peninsula section of the Washington CP and were generally allied with the Bellingham-based dissidents. I was at a meeting with the Bellingham people where they claimed connections with secret factional groupings in the CP in Chicago and cited documents that sounded very similar to Ad Hoc Committee Bulletins. This grouping later formed a west coast branch of PL. Around the same time, I was in Chicago on CP stuff and heard rumors of the secret ‘Stalinist’ and/or ‘Trotskyist’ factions that were being blamed for a major public attack on a leading Black Chicago Communist, Claude Lightfoot, who had been labeled as a ‘slumlord’ — with what I later understood to be some plausibility. Leonard and Gallagher detail a number of points where the Ad Hoc Committee played a significant role as a direct tool of the FBI control group that handled the operation. This control group had a significant overlap with the Solo operation and there is a possibility that Childs himself had some involvement (see pp 135-6). I recommend reading these chapters, but I will be concentrating on a narrower subset of issues around the disruption of the party-building attempts of the RCP and its ‘National Liaison Committee’. STO was not in the ‘party-building’ tendency, but we had the same political roots, SDS/RYM II and various factional splits from the CP. We worked with most of the key players in that sector of the movement, including the Midwest groupings that eventually joined the RU and those that became the rival October League slightly later. We also knew the people around the Guardian newspaper and the Philadelphia Worker’s Organizing Committee that became Line of March organization. Finally, we knew central figures in both the Black Workers Congress and the New York Young Lords that were heavily involved in these ‘party-building’ ventures. In short, we were aware of, but not involved in, the maneuverings that are detailed in the book, and we certainly were familiar with the central issues: the preconditions and timing involved in forming a ‘party’; the relationship to the Black Liberation movement, Black Nationalism, and Black and Brown autonomy within communist groups, the different estimates of the changing trajectory of Chinese Communism, the approach to ‘armed struggle’. Through these existing relationships, the anti-repression work that we had begun had hints of the state operation against the Maoist party-building efforts. We had researched Joe Burton, an FBI defector, who had formed a number of small Maoist collectives in the U.S. and Canada that were FBI fronts tasked with preventing any meaningful consolidation among U.S. Maoists. In New State Repression, Ken L. mentions Joe Burton’s fake Maoist collectives as an early U.S. adaptation of Kitson’s ‘pseudo-gangs’ counter-insurgency tactic. He also notes that Burton described an FBI operation run out of Chicago where a very knowledgeable ‘older man’ (presumably an ex-communist [Childs?]) had worked out sophisticated methods to develop and exacerbate differences within various revolutionary tendencies. At the time we were not sure how much credibility Burton’s revelations warranted, since he had left the FBI over a money dispute and was attempting to build a career out of his previous role. However, his story is consistent with what Leonard and Gallagher discovered about the Ad Hoc Committee from various released FBI documents. (Leonard and Gallagher deal with Burton at a number of points, in the text; see p. 19, pp.155-56, p. 165 and the related footnotes. They appear to have some confusion over whether Burton’s first name is Joe or James. The Government documents indicate Joseph). While Leonard and Gallagher raise intriguing points about Burton and some similar figures, I want to concentrate on the Ad Hoc Committee’s very different relationships with two central figures in the RU/RCP, Don Wright and Leibel Bergman, who play a much more central role in the book’s main narrative. After my CP tenure ended and when STO was forming in Chicago, a number of us knew — or knew of — Don Wright. (I had heard of him through his father who was in the Chicago CP and some other CP contacts.) Wright gets an extended treatment in a couple of chapters in Leonard and Gallagher’s book that prove he was a FBI informant throughout his political career. (‘Informant’ is an inadequate description of the importance of his role). I worked in a steel plant in Maywood with Gerry Lyles, who appears in FBI documents (see p. 124-125) as a personal friend and close political associate of Wright. From the factual context of the documents, Lyles was almost certainly FBI-affiliated as well. My memory is dimming, but I think Lyles might have attended some STO formative meetings. Wright presented himself to other leftists as connected to a range of militant Black Nationalists/Panthers as well as to some ‘heavy’ pro-Chinese anti-revisionists in and around the CPUSA. The book strongly suggests that he also was believed to be connected with the Ad Hoc Committee and that this was a major factor in his recruitment into the RU in 1970 (see p. 120). That connection actually did exist, but its content was quite different from what Wright’s comrades thought. The same FBI collective that composed the issues of the Ad Hoc Bulletin, also received regular reports from Wright and provided regular tactical guidance for his activity. When Wright entered the recently formed Midwest RU groupings that were primarily left over student collectives from RYMII, his credentials as an older, apparently experienced and well connected, Black communist gave him a number of advantages. He quickly became their ‘expert’ and spokesman on military issues and on Black Nationalism which were central questions for the RU of the period. Wright rose to a position of national leadership in the overwhelmingly white organization in a matter of months. When the RU national office moved to Chicago, largely at his instigation, Wright was put on the four member national executive, where he had the Chicago and Midwest ties. A short time later Wright took over some of Leibel Bergman’s role and became the RU’s representative on the “highly secure” National Liaison Committee where he was responsible for working with the Black, Asian, and Puerto Rican groups that were seen as crucial potential components for a national Maoist party formation. Within a very few months, by the end of 1973, Wright had been expelled from the RU after effectively disorganizing the National Liaison Committee and closing off serious movements toward the political unification of the most substantial components of U.S. Maoism. After Wright, the Maoist movement was consumed by doctrinal disputes that provided few possibilities or incentives to develop any meaningful political initiatives towards unity. Of course, Wright wasn’t the only factor in this outcome and he certainly had the advantage of some favorable circumstances. However, it’s hard to overstate his disruptive impact. Let me return to the role played by Bergman in this saga. Leonard and Gallagher are fairly certain that Bergman was not an agent, but they show that he was extremely susceptible to manipulation by the Ad Hoc Committee. Bergman and his wife met regularly with contacts that they regarded as old friends and comrades dating back to their days in the CP and possibly to the years spent in China. Bergman clearly believed that these contacts were still active in the CP (see p. 65), and were a part of the Ad Hoc Committee. He provided them with explicit organizational details about the RU, including factional potentials and concrete critical estimates of individuals along with a good deal of gossip about Chinese Communist issues. Ironically, considering how the relationship between Bergman and Wright eventually worked out, these Ad Hoc Committee contacts appear to have been the source for Bergman’s initial credentialing of Wright. [Bergman] “…is such an egotist that only he would control such contacts; that in no instance could they perceive Bergman allowing a separate cover liaison…” (See page 66, footnote 51). Bergman’s exclusive relationship with the Ad Hoc Committee contacts provided a continuing stable security cover that would have been hard to maintain, if the oversight by the RU leadership had been more collective. So what should we learn from this? It’s important to remember that the seventies, the crucial decade for the Ad Hoc Committee operation, was a period when the repressive apparatus appeared to be very much on the defensive. Nevertheless it was able to maintain and consolidate a very sophisticated repressive scheme that was essentially successful, and that has only been partially uncovered some three or four decades after the fact. Most of the key targets of this operation are still not aware of it — or at least are unwilling to discuss it openly. The outcome of the SOLO operation might be seen as a counter-indication. It also functioned for many decades, but, unlike the Ad Hoc Committee, Solo has been definitively exposed. Leaving aside how widely the SOLO case is understood on the left — not so much I think — this line of argument obscures some unique features of SOLO that both explain why the FBI cooperated with its exposure, and why the negative consequences from the loss of cover were minimal. First, both Soviet Communism and any actual Maoist alternative to it were no longer serious factors by 1990. This removed a major external need to maintain operational security for SOLO. Much more important, the FBI had a specific incentive to cooperate with the exposure of SOLO. It provided an opportunity to ‘explain’ their concern with ‘communist involvement’ in King’s SCLC, and a belated partial ‘justification’ for their harassment of King that had been thoroughly exposed and become a major PR disaster for the FBI — particularly given the circumstances of his assassination. The SOLO exposure was a path towards resurrecting the public relations legitimacy of ‘our intelligence community’, a matter quite relevant to the current political context. My main point in this review is that the repressive apparatus develops capacities and capabilities in a cumulative additive process and has a sufficient excess of resources to continue the process even when the perceived needs aren’t as urgent as they once were thought to be. These “techniques and procedures”, as they call them, will not have to be developed from scratch when the ruling class need for them re-emerges. It is correspondingly important that radicals not have to begin from scratch to understand and respond to them. Absolutely true, and I could extend the examples. Essentially all of the many informer/provocateurs that we profiled were enabled by the endorsement and sponsorship of some element of the leadership of the group that they were targeting. This was seldom noted, and almost never systematically criticized, even after some of them were decisively exposed. A closely related second point is that the repressive apparatus will be compiling a broader and increasingly more accurate picture of the strengths and weaknesses, the internal contradictions, of its potential antagonists — us. This will continue, not only in periods of sharp struggle, but through periods of relative lull which provide the opportunities to expand its technical capabilities to make use of this information when the needs are greater. My final point is that we should keep all these matters clearly in mind when we look at how current organizations, movements, and struggles are doing…or how poorly.